This page is updated weekly during term time when a new mailing to parents is sent out. If you would like to receive the email notification of the weekly update, which is usually on a Friday, then please contact us at mailing@abingdon.org.uk. Have you thought about boarding? Our boarding houses are full to capacity (over 100 full boarders and 30 weekly boarders) and we want to make sure that our current pupils are first in line to take up boarding places should they want to. We are therefore offering third and fourth year day boys an opportunity to experience a ‘taster night’ towards the end of the summer term. We hope that this will appeal to those who are considering boarding in future years (from 2020 and beyond) and so they can apply in good time to avoid disappointment. Places are limited depending on beds available, but if you are interested please complete this form or contact Lucy Hamerton by email lucy.hamerton@abingdon.org.uk. The John Rayson Award is a memorial to the late John Rayson (1924-2012), an Old Abingdonian (1942) who gave a lifetime of service to Abingdon School. The award will be given to a current pupil to help fund a personal project/experience that embodies the defining characteristics of John Rayson - adventure, courage and resilience coupled with service, loyalty and commitment. The award carries a value of £250. All current pupils of Abingdon School are eligible to apply. Further information is available here. ASPA and the OA Club have joined forces to offer travel awards to upper and lower sixth pupils undertaking some form of travel and activity either during the summer or in their gap year. The awards range from £50 to £500 depending on the activity and its benefits. Further details, and the conditions attached to the awards, can be found on the School website. Tickets now on sale for the ASPA Quiz (whole school) to be held on Saturday 27 April – start time 7.15pm for quiz to start at 7.30pm. Three course ‘Chip Shop style’ meal and quiz for £23 per head. Teams of 8. For further details and ticket booking please see here. Thank you to those parents who have used the Saturday Bus Service in the Michaelmas and Lent terms. We will continue to run the service next term on the following term time Saturdays: 4 May, 11 May, 18 May, 8 June, 22 June & 29 June. The pick up points and timings will remain the same as they have been throughout this academic year. Any comments or queries in this regard can be forwarded to the Director of Sport and PE. In planning for this coming term, please observe this extract from the Parents' Handbook: boys are expected to be available for matches against other schools unless specific permission has been sought from and granted by the Headmaster. Any request should be made well in advance, at least one week before the fixture and copied to the Director of Sport and PE, Pete Bignell. Abingdon has a strong tradition of participating in interschool fixtures across the age ranges. In recent years we have strengthened our fixture list, and been more ambitious in the schools we have been playing, and we are putting out more teams. Please avoid asking for leave of absence. We are keen the boys practise and play together, that the boys develop an allegiance to the School, and that our opponents have the best opposition we can provide. Thought-provoking blogs from the Abingdon Community. From the Headmaster’s “Confidence not Swagger” - in reply to The Times, to “Flinging wide the automatic gates - a time for partnerships?”, the School Blog takes a look at the latest views and opinions from the Abingdon community. The wide-ranging contributions make for very interesting reading and are posted fortnightly during term time at abingdon.org.uk/school_blog. Please do take a look. It is with great pleasure that I present inaugural Abingdon School in Partnership newsletter which gives parents a taste of the activities being undertaken by staff and students at Abingdon and across our partner schools and the town as a whole. As a community we fully embrace the idea that educational collaboration is mutually beneficial to all involved and as a result partnerships are a core element of our school development plan. If you would like to find out more about the Abingdon School partnership program please see our website https://www.abingdon.org.uk/partnerships and https://www.abingdon.org.uk/abingdon_science_partnership, follow us on twitter @ASPartnerships and instagram @aspartnerships. You can also contact me directly at robin.southwellsander@abingdon.org.uk. School Choirs Evening Concert - Thursday 21 March, 6-7pm in the Chapel. Our last musical event of the term - and a chance to hear the school's four weekly meeting choirs - involves Chapel Choir, Gospel Choir, Joint Chamber Choir and our close harmony ensemble, Abingdon Academicals, directed by Adam Treadaway. The concert is in the school's chapel - it will last about 50 minutes, admission is free and all are most welcome. Music Technology Lessons at Abingdon School from the Summer Term. The Music Department is offering an exciting opportunity to a limited number of pupils to learn about its latest state-of-the-art music technology equipment. The lessons deal with how music/sound is composed, recorded and produced within the digital studio environment. This will involve the use of a variety of software packages and hardware equipment to unlock the vast potential of recording musical ideas and sound. Recent pupils have gone onto courses and careers in commercial music and sound recording and an understanding of the use of this essential technology will give future candidates an important edge. The lessons are offered on the same basis as individual music lessons, which currently cost £22.95 for a 30 minute weekly lesson. Places are limited so are offered on a first come, first served basis. If you are interested, please contact the Director of Music by email. “Following a student lecture this week given by Cam Adair on: “How gaming and social media are designed to keep you hooked” he is offering a free webinar for parents on Tuesday 30 April from 7pm-8pm. Here is the web address to register if you are interested. We are hosting lectures and events in the Amey Theatre and Yang Science Centre as part of the festival. We are very keen to listen to parents' views on how we manage reporting at Abingdon. We would therefore appreciate your feedback on how and what we communicate, so that we can improve what we do. Please could you take a few minutes to give us your views. Most of the form just requires 'tick box' responses but there is a section at the end of each of the two sections for you to offer more expansive comments if you wish. Please could all replies be in by Monday 18 March. Mr Lomax's presentation from Monday's 2nd Year Parents' Evening is available in PDF format. March and April are critical months for the 5th Year Work Experience Scheme. If your son has not yet applied for a summer work experience placement, time is running out, and he should make applications as soon as possible. There is a special 5th Year Work Experience Scheme page on Firefly with links to employers who offer work experience placements, and your son can also approach employers of interest who don’t offer formal work experience schemes but may be happy to host a placement if asked. If your son has made applications, but has not heard back yet, some polite but persistent ‘chasing’ may be needed. And, if your son has already received an offer of a placement, congratulations! If he has received more than one offer, he can undertake more than one or request to defer one perhaps to the October half-term next school year. Parents are strongly advised to download from this web page a checklist of things to consider when preparing for their son’s work experience placement; there is no need to register the placement with Abingdon School. If I can be of assistance, just let me know. Michael Triff, Head of Career Guidance (michael.triff@abingdon.org.uk, 01235 849129). Following a seminar in the afternoon with all the 5th Years called 'Ace your exams'. Elevate are running a parents' seminar giving advice on how to support your sons with their revision. Please fill in the form if you would like to attend. Just a reminder that the L6 Parents' Evening will take place on Tuesday 12 March at 5.30pm. From 7-7.30pm in the Amey Theatre, Caroline Taylor, Director of Universities, will give a presentation to all boys and parents on the UK university application process. 3rd Year - up to bed at 9.30ish, 15-20 minutes of reading (so no screens or TV!) and then lights out at 10pm. 4th Year - up to bed at 9.45ish, 15-20 minutes of reading (so no screens or TV!) and then lights out at 10.15pm. 5th Year - up to bed at 10ish, 15-20 minutes of reading (so no screens or TV!) and then lights out at 10.30pm. Sixth Form - more flexible, but again aiming for a period before sleep without screens or TV and aiming to be going to sleep by 11pm. These are the routines that we aim for in our boarding houses and that would be advised by most schools. If your son is struggling to make these times due to pressure of work, then I would ask you to contact his tutor, and to encourage your son to chat to his tutor about managing his workload and commitments. As ever, please do feel free to discuss any concerns with his housemaster as well. If your son feels these timings are harsh or overly restrictive, do feel free to blame me - I am happy to discuss with him in person the rationale behind these routines. We are very keen to listen to parents' views on how we manage reporting at Abingdon. We would therefore appreciate your feedback on how and what we communicate, so that we can improve what we do. Please could you take a few minutes to give us your views. Most of the form just requires 'tick box' responses but there is a section at the end of each of the two sections for you to offer more expansive comments if you wish. There are several music events remaining this term. Please do consider attending - all are most welcome and admission is free. Solo Concert Platform No 4 - Wednesday 13 March at 6pm, CMR. Come and hear about twenty of our solo instrumentalists in a wide range of repertoire. Intermediate Solo Competition - Thursday 14 March at 6pm, CMR. This term's solo competition is for solo instrumentalists between the levels of grade 6 and grade 8. Our visiting adjudicator is Thomas Neal, the new Director of Music at New College School, whose role at Portsmouth Grammar School was recently filled by Mr Cotton. School Choirs Evening - Thursday 21 March at 6pm in the Chapel. Here is a chance to hear all four of our senior choirs in action - Chapel Choir, Joint Chamber Choir, Gospel Choir and the Abingdon Academicals (close harmony ensemble). Last chance to book for the Annual Boat Club dinner - ticket sales close on Sunday 10 March. Follow the Amey Theatre on Facebook and Twitter to keep up to date with the latest performances, concerts, Live Screenings and much more! We wanted to remind you that Ultimate Activity Camps have an Early Booking Offer which ends on Tuesday 12 March for Easter and Summer dates. If you do not know which dates you need yet, you can book now and change dates for free up to 14 days before. Parents can book online (www.ultimateactivity.co.uk) or call their friendly team on 0330 111 7077 (local rate). Mr Lomax's and Mr Crisp's presentations from Thursday's 3rd Year Parents' Evening are available in PDF format. You might have overheard your son talking about or doing an online search this week for the “Momo challenge”. This is a character, shown with bulging eyes, supposedly appearing on WhatsApp setting children dangerous “challenges” such as harming themselves. However, charities say there have been no reports of anybody receiving messages or harming themselves as a result and are warning that media coverage has amplified a false scare story. The UK Safer Internet Centre reported that it was “fake news”. Nevertheless, the advice for parents at this time is rather than focusing on the specific momo meme, to use the opportunity to remind their children about internet safety, as well as having an open conversation about what children are accessing. I attach a helpful guide to the internet which you might find useful in your ongoing discussions with your sons. That said if you have any concerns about self-harm at any stage please contact Mark Hindley the Designed Safeguarding Lead and Deputy Head Pastoral or Paul Gooding, Head of Wellbeing. In a previous mailing it had been mentioned boys had to send a request to the Exams Officer if they would like their results emailed to them. The way results will be released has now changed all candidates will be able to access their results via 'My Abingdon' portal by 9am on results days. Boys will still be able to come into school to collect their results and any not collected will be posted to the home address that afternoon. We will no longer be sending individual emails. Also the venue for results day collection has changed from the CMR to the Sixth Form Centre in Beech Court. The annual Abingdon Independent Schools’ Careers Convention, jointly run by Abingdon School, Our Lady’s Abingdon and St Helen and St Katharine, will be on Friday 15 March 2019, 7pm - 9.30pm at Abingdon School. The event is compulsory for 5th Year students and optional for L6 and U6 students. Parents are welcome; no booking is necessary. This is an exceptional opportunity for students to gather information about careers of interest and educational routes into those careers. The format of the event is that of a careers fair, with students choosing joining small discussion groups led by career representatives. Concurrent with the career fair will be two panel presentations by experts, one called 'What employers seek: Preparing yourself for the future job market' (focusing on what employers look for when recruiting for entry level roles) and one called ‘Alternatives to university: taking the road less travelled’ (focusing on vocational and professional courses, apprenticeships, and school leaver programmes). Please arrive and be seated in the Amey Theatre by 6.45pm for a prompt 7pm start; this will give you time to read the event programme and plan your evening. If you are driving to Abingdon School for this event, please be aware that there will be very limited parking on the School site and in the visitor car park on Park Road. You are therefore encouraged to park at St Helen and St Katharine School and to walk to Abingdon School. Allow yourself a comfortable 10 to 15 minutes to reach the Amey Theatre. This is a reminder that David McGill, will be giving a short talk in the CMR on Thursday 7 March, 7pm for parents and pupils about the History Department's Battlefields trip taking place in the Easter holidays (Monday 15 - Wednesday 17 April 2019). It is entirely voluntary and will just cover the sites being visited in a bit of detail. If you intend on coming please email David McGill. The talk should last about half an hour. Solo Singers Platform - Wednesday 6 March, 6pm, CMR. Here is an opportunity to hear our marvellous singing teacher, Andrew Yeats working with his singers in a wide of repertoire from Bach to Cole Porter (Ol' Man River…)! We have two boys in 3rd and 4th Year who are about to take their ARSM singing diplomas and there should be something for everyone in this concert. Please do join us! National Pro Corda Chamber Music Competition success. Congratulations to the two 5th Year String Quartets and the Dvorak Piano Quartet musicians who have gained places in the regional semifinals of the National Pro Corda competition to be held in Salisbury Monday 4 March. We wish them the very best and keep our fingers crossed that we might have a finalist ensemble this year! Tickets are now on sale for the 4th Annual Football Club Awards Dinner will take place on Friday 22 March 2019. The evening will start at 7pm with a drinks reception followed by dinner, speeches and the presentation of awards. This year we hope to be joined by former Premiership Football referee and Football pundit Dermot Gallagher as our special guest for evening, and look forward to hearing of his stories in the professional game as well as celebrating the boys achievements on the evening. Tickets can be purchased through the school box office. We would like to let parents know that our courses and holiday camps for 2019 are now available to browse and book. We have extended our programme this year, to include a more varied range of activities, providing an opportunity for students to develop new or existing skills, led by qualified, experienced and DBS-checked coaches and staff. We also have Ultimate Activity Camp and Academies of Sport running exceptional courses and inspiring sport coaching camps throughout Easter and Summer, which are running at both Prep School and Senior School, as well as at Tilsley Park. The full range of Courses and Academies can be found listed in this brochure. For more information or to book, please visit the Abingdon School Enterprises website. Third Year Event - save the date. Mexican theme night Saturday 18 May, 7.30pm in the Dining hall, tickets will go on sale very soon. It's set to be a fun night. Chairman's Charity Concert - 7.30pm, Saturday 2 March. The Abingdon-based Waterloo Band & Bugles of The Rifles will give a concert in aid of SSAFA, the Armed Forces Charity. Tickets are just £12 (£10). During their revision leave Upper Sixth formers are not expected in School unless they have an exam. Sixth form games options will run as normal but we appreciate some boys may not be in attendance. Team players are encouraged to get to practices when they can. Boys are encouraged to keep exercising for their own wellbeing. Half term provides a good opportunity for boys to have a haircut. From the dress code: Hair must be cut so that it does not lie on the collar nor is excessively close-shaven. Hair must look smart, and must not appear to be attention seeking. Bleaches or dyes that are in blatant contrast to a boy’s natural colour are not permitted. Parents are asked to provide their growing sons with shirts sufficiently large for them to have their top buttons done up throughout the day. Boys may wear jumpers under their jackets, but they need to be dark blue, V-necked and without a zip. The exception, for the sixth form, is that their V-necked jumper may be monochrome and of sober colour. The full uniform list and dress code is on the website. Please see the attached handouts for parents who were unable to attend the Lower School and APS Year 7&8 Digital technology awareness evening. Preferences for fourth year subjects will be collected in the week after parents’ evening on Thursday 28 February. Further details will follow after half term. The parents’ evening will be a chance to discuss GCSE subjects with your son’s teachers. We would like to invite all hockey players and parents (from Third Year to Upper Sixth) to the annual Hockey Griffins Dinner & Awards on Saturday 23 March. After playing our final ISHL 2019 matches against Bradfield College in the afternoon, the evening will start with a drinks reception in the Charles Maude Room at 7.30pm. A three-course meal, speeches and end of season awards will follow from 8pm. There will be a cash bar and raffle on the night. Tickets for the dinner are £40 per parent and £25 per player, and will be allocated on a first come first served basis. This event always sells out quickly, so we encourage you to apply early through the school box office. Any profits made on the evening go towards the Griffins Hockey Club fund. This fund has most recently purchased masterclasses from international players, 30 x young ones sticks for all to use, team dugouts and scoreboards up at Tilsley Park. The Club is currently fundraising to contribute to the purchase of top class Goalkeeper coaching. Proceeds from the raffle will be donated to Blue Skye Thinking. We hope you can join us for a fitting celebration of the end of hockey season. Please note all the JCQ notices and CIE notice for the External Exam Candidates are available to view on the school website. These were sent to the boys on Wednesday 9 January. 5th year mock exam results were posted to the parent portal today and an email regarding them was sent to all 5th year parents at the same time. If you are having trouble accessing the portal please contact support@abingdon.org.uk. New Year Japan Tour Benefit Concert. Thank you to all those parents who supported our fund-raising efforts on Thursday evening. With the silent auction of promises, together with the revenue from ticket sales, we raised a total of £4,500, with the results of a couple of extended high value lots coming in at half term. Solo Concert Platform on Wednesday 30 January at 6pm. Do come and join us to hear some of our solo musicians, including the last movement of Elgar's Cello Concerto with new music scholar Oliver Simpson. This is an event not to be missed and admission is free. Menine Brass Quartet Concert on Wednesday 13 February at 7pm. This event has been organised for all our brass players at Abingdon - and we hope you will support us by bringing your sons and friends and family to hear the concert. The quartet consists of a group of gifted young brass players, newly graduated from Music College. Their leader, William Padfield, was a pupil of the Headmaster at Reading Blue Coat School and the quartet are at the top of their game as players and as an ensemble. We are delighted they will be joining us for an afternoon workshop and masterclass with the boys and a concert in the evening to which parents, friends and family are very welcome. It should be a great evening, starting at 7pm and ending before 8.30pm. Please support us and order your tickets using this link. Gloucester Cathedral Evensong with Chapel Choir on Thursday 14 February, 5.30pm. Chapel Choir parents will have noted, no doubt, the next Chapel Choir event. Do join us if you can at this inspiring place. Evensong starts at 5.30pm. Please click thisf link if you are interested in reading the articles for Michaelmas term's fourth year History and Politics Society magazine. Please click on the link below to book your free ticket to an exciting talk organised by the History Society on Tuesday 26 February from 7pm to 8.30pm in the Amey Theatre. Richard Rampton QC will be talking about his experience defending Deborah Lipstadt against Holocaust denier David Irving. The case was made famous by the recent film Denial. Parents are asked to consider local residents when parking outside the homes of our neighbours, and when driving round the narrow roads close to School. Please adhere to the speed limit of 20mph along Park Road and Park Crescent, which are private roads. Elevate is running a fifth year parents' seminar on Tuesday 19 March on revision techniques for GCSE. Please make a note of the date. UCAS: An introduction to the UK university application process: Tuesday 12 March, 7pm, Amey Theatre. Part of the L6 parents' evening, this is an important opportunity for boys and their parents to learn about some of the key features of UK university applications, the admissions process and key dates. Mrs Caroline Taylor, Assistant Upper Master, Universities, will give a presentation outlining the UCAS process and what is expected of the boys at each stage, as well as outlining key factors to consider when choosing degree courses, universities and writing the personal statement. Following this presentation, at 7.45pm in Beech Court, Mrs Taylor and Mrs Gibbard from the UCAS office, as well as other members of the Sixth Form staff team, will be available to answer any questions. There will also be the opportunity to chat to current U6 boys who have recently applied to UK universities through UCAS. Refreshments will be available. A member of the Oxfordshire team of the National Citizen Service will coming into the 5th Year assembly on Thursday 24 January to inform our pupils about the NCS Summer 2019 Programme and let them know how they can sign up to this scheme. All the information about his scheme is included in the attached letter. We have been invited, as a school, to join in with a national wellbeing survey, run by University College London and Manchester University, in conjunction with hundreds of schools across the country. As a school, we think this is an exciting opportunity to get involved in, not least as it intends to run for at least 3 years. We will be inviting our students from year 8 and above to take part in March 2019. The survey will take, on average, about 25 minutes for students to complete. Please refer to the standard letters from the research team at University College London for further information. As these are generic letters which are sent to all schools we have a few adjustments that we would like to make you aware of when we do the Abingdon survey. In terms of data transfer, Abingdon school will not be sharing any identifiable data with the researchers (eg name/surname) only unique anonymous identifier numbers which only the school has access to. The only other three bits of data we will be sending to the study are gender, year group, and school name. We will not be sharing data on any other characteristics, such as special education needs or emotional wellbeing for example. The survey will be entirely voluntary but we would hope that to help with the study, the overwhelming majority of boys will want to take part. If however, you do not want your son to take part please discuss this with him and sign and return the form on the attached letter from Dr. Jessica Deighton and return to me. Also, on the day of the survey if your son decides that he does not want to take part he does not have to; the whole process is entirely voluntary. If you have any questions about the project, in general, please contact Paul Gooding (Head of Wellbeing) and if you have any data protection questions please contact Amy Hadden (Compliance Officer) or Dr. Jessica Deighton (lead researcher at UCL) as shown on the attached information. We are hosting a silent auction of promises (listed below) to support the First Orchestra and Big Band Tour of Japan. There are some truly incredible lots and all parents can make a bid. Successful bids will be announced by the Headmaster at the Japan Benefit Concert this coming Thursday 24 January, but our two “Star” lots will be open to bids until the start of half term (6pm on Friday 15 February) – this will give you time to confer with family or friends, join forces perhaps and enter that winning bid! There will be opportunities to bid on the night of the Benefit Concert, but if you can’t attend, all you need to do is contact Caren Hardiman with your lot preferences and maximum bid – it’s that easy! Please follow this link to more information on the lots. One week in a beautiful 17th Century farmhouse in the Lot region of SW France (sleeps up to 12 plus exclusive swimming pool). A Theatre Weekend in Chelsea/Kensington, including a two-night stay at an exclusive 2-bed apartment and theatre vouchers to the value of £100 - and champagne! A Sunday lunch for 4 people at the Vineyard Spa Restaurant, Nr Newbury. City Mazes Escape Room Experience for 6. Loose Cannon Brewery Tasting and Tour for 4 People. A Pair of Tickets to hear the world famous CBSO - and an orchestra conducting experience at Abingdon School. A Meal for 2 with a Bottle of Wine at the esteemed Pierre Victoire restaurant in Jericho, Oxford. A Deer-Stalking Experience in the Cotswolds for one person with a qualified and licensed countryman. A two-day Cookery Course for up to three teenagers (or pre-university students) to learn to cook excellent recipes (3 lots for separate bidding). A Seasonal Supper for 4 and a bottle of organic wine at a pop-up refectory in an ancient threshing barn at Sandy Lane Farm near Thame. Japan Tour Benefit Concert - Thursday 24 January at 7pm, Amey Theatre. Blow away the New Year Blues with our talented musicians - 2nd Year Choir, First, Second and Chamber Orchestras, Brass Band, Lower School Band, Big Band and Jazz Ensembles, We also have an exciting silent auction of promises (see above), with the Headmaster presiding. Please come early to bid and see details of the lots on offer. We'll have an extended interval to facilitate further bids. Boys will be expected to have supper at school from 6pm. Please bring your friends - proceeds go to the tour fund! Christmas Concert DVDs. These are nearly ready for distribution and we hope to do so at Thursday's concert. The DVD looks great - many thanks to Keith Hoult and his brother at 3rd Strike Films for filming and editing. If anyone else would like a DVD priced at £10 each (in aid of the tour), these will also be available at the concert. We are delighted to let you know that Ultimate Activity Camps are returning to run their fun and engaging holiday programmes at Abingdon School Sports Centre and now at the Prep School this Easter and Summer. They work with some of the best independent schools in the country and have a strong reputation for quality holiday programmes. Established by a team with over 25 years’ experience of running high quality Ofsted-accredited holiday camps, children aged 4-14 years will have the chance to try over 40 exciting sports, games and creative activities each week. Their activities will be delivered by engaging and enthusiastic staff who will instruct and encourage children to try new activities and make new friends – and naturally have lots of fun! See their information leaflet and website for full details of their activities and offers or call 0330 111 7077. Fee paying schools are increasingly the target of fraudsters and the level of sophistication of scammers continues to grow - a number of other schools have been attacked over the Christmas holidays. Please be very cautious about emails (even if they do come from an Abingdon email) that ask you to change bank payment details or offer discounts in return for early payment (or payment by Bitcoin!). Abingdon has no plans at all to change its bank account or its fee arrangements. If you do want to query suspicious emails please do so by an alternative channel such as calling the Finance team as scams often hijack email accounts entirely. The 2019 edition of the Abingdonian magazine has been distributed to all boys who were members of the school last academic year. In the case of brothers, a copy has been given to the older sibling. The latest edition of the School's newsletter, Abingdon News, has been given to your son to bring home this week. Boys who are full boarders will have a copy posted home. The newsletter can also be viewed online. Any feedback regarding school publications is very welcome, please email communications@abingdon.org.uk. I am still looking for parent volunteers in several key career areas for the upcoming Abingdon Independent Schools’ Careers Convention in March. If you work in one of these career areas, and can volunteer as a career representative at the event (6pm-9:30pm), I would love to hear from you: Business (Operations); Charities and NGOs; Engineering (Aeronautical, Biomedical, Electrical, Nuclear); Environment, Conservation, Wildlife; Financial Services (Insurance, Investment/Fund Management); Fire and Emergency Services; Video Gaming; Government (Civil/Public Services); Journalism and News Media; Music; Product/Industrial Design. Please email michael.triff@abingdon.org.uk or register your interest online as soon as possible. Thank you! Michael Triff, Head of Career Guidance. Abingdon will host a Gap Year Advice Evening for Sixth Form pupils and parents on Thursday 17 January 2018, 6.15-7.45pm in the CMR at Abingdon School. The event will feature a presentation about the reasons to take a Gap Year; the pros and cons of a Gap Year; setting goals and finding relevant experiences during a Gap Year; the likely costs of a Gap Year; and the transition following return from a Gap Year. In addition, there will be a panel of Old Abingdonians on hand to share their own Gap Year story and insights. No booking is necessary; just show up on the night. Pupils can also download (from the University Admissions page of Firefly) the Abingdon School Gap Year Guide, which is intended to help pupils think carefully through all the considerations involved in electing, planning, and managing a Gap Year. If your 5th year son has already applied for, and even secured, a summer work experience placement, please praise him for his initiative! The ‘early bird catches the worm’ when it comes to work experience, especially at employers with popular work experience schemes. If your son has not yet applied for a summer work experience placement, please encourage him to do so…and soon. There is a special 5th Year Work Experience Scheme page on Firefly (the pupil intranet) with a list of employers who offer placements and links to application information. Most summer work experience schemes have application deadlines in January or February, so time is of the essence. Of course, your son can also approach employers of interest who don’t offer a formal work experience scheme but may be happy to host a placement from time to time. Parents are strongly advised to download from this web page a checklist of things to consider when preparing for their son’s work experience placement. Your support and encouragement is very much appreciated. Michael Triff, Head of Career Guidance. Do join us to pray for the Prep and Senior Schools. This term is a very busy one for our musicians. The Lent Term Music Calendar gives up to date information about our plans. Here are the main events of the first half of term to which all are most welcome. Wednesday 16 January at 6pm in the Amey Theatre - Music Society Piano Masterclass with Katya Lebedeva. This is an opportunity to see six of our senior pianists play to one of London's top piano teachers from the Royal College of Music and should be a must for all our piano pupils and their families. Please see the poster advertising this concert. Boys can sign up for an early supper and stay for the masterclass. Friday 18 January - A whole First Year trip to hear the CBSO is a special educational concert enabling them to “Discover the Orchestra”. All First Year parents have been sent information and a Google consent form to complete. Thursday 24 January at 7pm in the Amey Theatre - New Year Japan Tour Benefit Concert. The concert will feature our main ensembles, articulated in an extended interval, we hope, by an auction of promises in aid of our summer tour to Japan and Hong Kong. If you have something you can donate to support our tour we would be most grateful to hear from you and the promises will be advertised in next week's mailing, allowing pre-concert bids up until midnight on 23rd. So far the promises include a weekend in a London apartment and a week's use of a large farmhouse in SW France! Please follow this link to order tickets. Wednesday 30 January at 6pm in the CMR Solo Concert Platform No 3 - a performing opportunity for many of our talented soloists. Wednesday 13 February at 7pm in the Amey Theatre - Menine Brass Quartet Concert. This is a must for all our brass players. This young professional quartet will be working with our brass players in an afternoon masterclass and will present an exciting and varied repertoire in the evening. Please do support us and follow this link to the website to order tickets. The last ASPA mailing was sent via the school this week. See details. ASPA began to use Classlist in September last year and this is now the primary method for parents to contact each other. If you have not signed up to Classlist you will still receive (via Classlist) any announcements that ASPA send to all parents or to your year group. If you do want to join Classlist, so that you can also contact other parents yourself, and haven’t done so yet, please look out for the recent invitation which was sent from Classlist. Any queries to aspa@abingdon.org.uk. NOTE: Abingdon School do not use Classlist for any communication to you nor do they monitor Classlist. This is used by ASPA only for parent to parent contact. Public examination timetables for Summer 2019 are now available on the School Website. Boys' personal timetables will be issued after half-term. Boys are expected to be available for matches against other schools unless specific permission has been sought from and granted by the Headmaster. Any request should be made well in advance, at least one week before the fixture and copied to the Director of Sport and PE, Pete Bignell. Abingdon has a strong tradition of participating in interschool fixtures across the age ranges. In recent years we have strengthened our fixture list, and been more ambitious in the schools we have been playing, and we are putting out more teams. Please avoid asking for leave of absence. We are keen the boys practise and play together, that the boys develop an allegiance to the School, and that our opponents have the best opposition we can provide. Timings of Saturday School buses are the same as last term. Senior Rugby Tour Dinner - save the date! Our current Lower 6th and 5th Year are going on tour to Chile and Argentina this summer. We are holding a senior tour dinner on Friday 15 March. Martin Johnson '2003 Rugby World Cup winning Captain' will be our guest for the evening. Please save the date and look out for opportunities to purchase tickets in the coming weeks. Please can parents ensure that the Health Centre is kept up to date with any changes to your son's health. This is especially important following a holiday period so that we can update our records accordingly. Boys with medication: all boys who carry any form of medication on them e.g. inhalers for asthma, Epipens must ensure that it is clearly labelled with their name and is still in date. Boys will be given a hard copy of the calendar at the start of term, but, for information for new parents, there is an online calendar which is kept regularly up to date. It is available from the front page of the website under 'Information'. In addition, there is a Term and Key dates page for 2019/20. This page highlights events such as parents' evenings, social evenings and evening presentations to parents. These will be published to the parent portal over the weekend. If you cannot see the report on the portal by Monday 17 December, please contact support@abingdon.org.uk which is also the contact if you do not currently have a log on to the portal but think that you should have one. The trips list has now been updated to include trips planned for the Michaelmas Term 2019, too. Many parents who attended the Christmas Concerts last week were able to place an order for a professional DVD recording of the Thursday evening concert, in a programme that included several of our senior ensembles. The programme is available here. If any other parent or guardian would like a copy, priced at £10, please click here to see the form and either send it to the Music Secretary by hand of boy, scan it and send to caren.hardiman@abingdon.org.uk or simply send her an email request. The cost will benefit the Japan Tour in 2019 and can be added to your school bill next term. This service will start on Saturday 12 January 2019. Please see the attached document which identifies the six different bus routes, including the individual stops and the designated times. We are very keen for as many boys as possible to use this service. It has been set up to ease the burden on parents of getting their sons to School for the inter School fixtures. There is no charge for this service. The buses are scheduled to arrive at School at 11.30am, allowing the boys time to have lunch in the Dining Hall, have a brief team meeting, and depart for their fixtures on time. Those boys who are involved in home fixtures will be catered for and supervised until the start of their matches. This service applies to all boys involved in sport on a Saturday afternoon, whether it be in cross country, badminton, hockey, football or any other sport. If you would like to make any comment, or have any queries in this regard, please contact the Director of Sport and PE, Pete Bignell. If you intend to utilise this service, please ensure that you son is at the appropriate stop 5 minutes before the scheduled departure. Abingdon has a strong tradition of participating in inter school fixtures across the age ranges. In recent years we have strengthened our fixture list, and been more ambitious in the schools we have been playing. Boys are expected to be available for matches against other schools unless specific permission has been sought from, and granted, by the Headmaster. Please avoid asking for leave of absence. Any request should be made well in advance, at least one week before the fixture. The Director of Sport and PE, Pete Bignell should be copied in on any such leave of absence request. To assist parental planning, the Sport and Physical Education Department email teamsheets for each of the age groups to parents on a Thursday evening. This will be sent to the primary contact, which we have stored on iSams, our internal database. It is vitally important that parents contact the appropriate member of staff in cases of illness on a Saturday morning so that replacements can be sought, and we do not end up in the embarrassing situation by being short of players to fulfil our fixtures. Sanctions will be applied to those boys who fail to comply with this request. Parents may also contact the Abingdon School Sports Centre Reception on 01235 849062 in case of any problems arising. Please find attached the new Middle School Scholars' Newsletter, a termly, paperless newsletter, which showcases the best of independent thought and inquiry from some of our scholars. This issue has been written by our fifth year academic scholars, so please do take a moment to read. Johan Nerlov and Will Taylor have also produced their own short podcast review of the term, including a discussion on the rapid progression of technology, for which I've also included a link, and hope you enjoy that too. Please save the date Saturday 23 March 2019 for the end of season hockey dinner. This is a black tie event and usually books out very quickly. Tickets will be released in the new year. Join us for our brand new Street Cardio and Ballet Fit courses taking place in the New Year, taught by ex-professional dancer and now Principal of the renowned Abingon based Marsh Tompsett School of Dance, Selina Marsh. We are delighted to be able to offer you a buy one get one half price offer on these courses, so you can bring a friend or book onto the second course for half the price. Please click here to download the full details. Term begins on Tuesday 8 January 2019 at 8.35am with tutor time, followed by lessons from 9am. It will be a week B timetable. Please be aware that these are correct timetables as is and any clashes shown are yet to be resolved. Also your son's personal timetable has now been released via parent portal: however, will be subject to change due to clashes (yet to be resolved) and access arrangements. All candidates will receive a personalised exam pack after the February half-term break. All candidates must be available on Wednesday 26 June as this is the JCQ Contingency day for GCSE and/or GCE examinations should sustained national or local disruption arise during the June 2019 examination series (GCSE, GCE, June 2019). Students and staff are invited to put on their festive knitwear for a good cause. A suggested £2 donation will be paid to the Magic Breakfast which delivers nutritional breakfasts to schools across England and Scotland and ensures that ‘No child is too hungry to learn’. Students are expected to be in normal school uniform with the addition of a jumper, it is not a full home-clothes day. A prize will be awarded to the best jumper on the day! Please do not park on Faringdon Road close to the coachpark over the cycle lane, as this hampers cyclists and car drivers. Also, the pavement is needed for pedestrians. Parents are reminded not to drop off or collect boys from the Park Lodge area, or Lower Field car park, please. This is because the area is already busy with pedestrians, pupils and school traffic. We therefore ask that parents drop and collect boys in Park Crescent, operating a one-way system travelling clockwise past the private housing to the west of Albert Park, and ending up near the boarding houses. The Crescent ends at a cross roads, where halting is obligatory on these private roads. Wheel clamping operates on Park Road and Park Crescent, so you are advised not to leave a car unattended. We are delighted to let you know that we have chosen to partner with Ultimate Activity Camps to run their fun and engaging holiday programmes at Abingdon Prep and Abingdon School Sports Centre next Easter and Summer! They have already been successfully running their camps this year at Abingdon School Sports Centre and have a strong reputation for their quality holiday programmes. Ultimate Activity Camps offer exciting holiday day camps with over 40 activities every week delivered by engaging and enthusiastic staff who will instruct and encourage children aged 4 to 14 years to try new activities and make new friends – and naturally have lots of fun! They have a very special Christmas Offer starting on Tuesday 18 December (when bookings are live to book) until Friday 4 January visit www.ultimateactivity.co.uk for details or you can call their friendly team on 0330 111 7077 (local rate). All Lower Sixth boys and their parents/guardians are invited to a presentation on the UK university applications process at 7pm on the evening of Tuesday 12 March 2019. This presentation forms an integral part of the Lower Sixth Parents' evening. During the presentation Mrs Caroline Taylor (Assistant Upper Master, Universities) will give an overview of the process, highlighting what is expected of each applicant, detailing key dates and deadlines, outlining what is required for the personal statement and providing insight into how to choose subjects and universities. Mrs Taylor and the Universities Team will also be available throughout Parents' Evening to answer any questions you may have about the process. Christmas Concerts on Wednesday 5 and Thursday 6 December, Amey Theatre, 7pm - Parents are warmly encouraged to apply for Christmas Concert tickets which are now selling fast. We perform on two evenings next week in order to accommodate everyone. The concert will include some marvellous works including Bach's Brandenburg Concerto No 3, Elgar's Pomp and Circumstance March No 1 and Rachmaninov's 2nd Piano Concerto, first movement. The following ensembles will be performing - 1st Year, Gospel and Joint Chamber Choirs, First Wind and Big Bands, Chamber, Second and First Orchestras. Please remember to book your tickets in advance and arrive in good time, as there can be a queue! Join successful comedian, TV writer and performer, Ruby Wax, as she talks about her latest book How to be Human at the Amey Theatre, Abingdon on Tuesday 8 January. Tickets are £22.50 and include a copy of How to be Human and a glass of wine or soft drink on the night. Copies of Ruby's previous book, Frazzled, will be available for sale at a discounted price. Doors open at 6.45pm for a 7.30pm start. Fifth Year: The 5th year will, as usual, be offered optional study leave help for the first three weeks of their revision leave in the form of subject clinics and supervised study rooms at school More detail on this will be given before they go on leave. Upper Sixth: Some Upper Sixth boys will be taking public exams in the week before their official revision leave begins (e.g. some maths units). In such cases, for an afternoon exam, boys will be permitted to take the morning as revision leave. No revision leave is granted the day before a morning exam. Lower Sixth: Now that all subjects have been reformed, there are no public examinations at all for L6th boys. The School will hold its own Lower Sixth internal exams in the week after half term in the summer and will then issue both exam grades and 'guidance grades' (projections towards A Level) to boys and parents to assist in the choosing of which subject (if any) to drop for Upper Sixth and to help with research into university options. Lord of the Flies - 29 & 30 November - SOLD OUT. Tickets will not be available on the door. ROH Live: The Nutcracker - 7.15pm, Monday 3 December. Tickets available here. To Fifth year parents: Sixth Form options evening, last Monday. We hope 5th form parents found our 'Towards the Sixth Form' evening on Monday helpful. Please do remember that it represented really just the first step in an on-going conversation, to be continued next term after mock exams. Mr May's presentation from Monday evening can be found in pdf form here. All parents and boys are warmly invited to the carol service at St Michael's Church, Park Road on Thursday 13 December at 6.30pm. The service will be a shortened form of the traditional lessons and carols from King's College, Cambridge. The boarding community will be in attendance and the outstanding Chapel Choir will sing. Do join us for this delightful and inspiring occasion. Japan and Hong Kong Music Tour 30 June to 10 July 2019. Parents of participants should note that a newsletter will be be sent shortly with details of the latest arrangements. Music Society Violin Masterclass with Levon Chilingirian - Wednesday 21 November at 6pm, CMR. Parents are warmly welcomed to attend our biennial visit from Levon Chilingirian for a Masterclass (open lesson) with a group of our top violinists. These occasions always give us a fascinating insight into the teaching and learning process and will be interesting for all our musicians and particularly our string players. We are encouraging all our string players to attend this event which, thanks to our Music Society, is provided free of charge,. For parents of these musicians, we are inviting the boys to sign up for an early supper so that they can attend without hunger pangs - please would you encourage them to come along. There's lots to learn and it should be hugely enjoyable. Christmas Concerts 2018 - Wednesday 5 and Thursday 6 December at 7pm. It's not too early to get your Christmas Concert tickets. For new parents, please be aware that we do the same concert twice so that we can accommodate everyone and they should know that the following ensembles are taking part this year: First Year Choir, Chamber Orchestra, Gospel Choir, Second Orchestra, Big Band, Joint Chamber Choir, Symphonic Winds Band and First Orchestra. Please see this link for further information and a link for booking Christmas Concert tickets. Parents are asked to encourage their son to attend if they so wish. Please see poster for further information. On Friday 23 November 34 boys will be delivering their EPQ presentations in an evening event which is running from 5.45 until 7.15pm. The presentations will be delivered across a number of classrooms in the Yang Science Centre, with three separate sessions at 5.45, 6.15 and 6.45.The presentations will be accompanied by refreshments and snacks in the lobby. Supervisors use the evening to grade their EPQ candidates. To achieve the highest grades the boys need to be asked challenging questions by an engaged audience so they would also be very pleased to see you there. Parents who would like to come to the presentations you would be most welcome. NT Live: The Madness of George III - 7pm, Tuesday 20 November. Lord of the Flies, Thursday 29 & Friday 30 November is completely sold out. Please email boxoffice@abingdon.org.uk for your name to be added to the waiting list. Only the Lower and Upper Sixth pupils in CCF are involved in the Remembrance parade on Sunday at 9am. Next week is the annual Anti-Bullying week. This year's theme is to “Choose respect over bullying” and we will be raising this issue with boys throughout the week. Please, could you try to find the chance to talk about this with your son as well? We will be exploring the idea that we can respectfully disagree with each other, and the importance of respecting others face to face as well as online. Boys will be encouraged to think about the idea that bullying is a behaviour choice, and if they ever witness it, of the need to speak out to a trusted adult/ carer or by reporting it via our whistleblowing system. We will also be thinking about what respect is and what this might mean at school, at home and in the community. Thank you in anticipation of your support with this. Please also feel free to visit the Anti-Bullying Alliance website and/or the School’s Anti-Bullying policy. If you haven’t already done so I also invite you to join our wellbeing twitter feed @Ab_Wellbeing. Is applying to US universities right for your son, especially since there are so many excellent universities in the UK (and other European countries)? If this is a question you and your son are pondering, you are invited to attend the US University Advice Evening at Abingdon School on Thursday 22 November 2018, 6pm to 7.45pm in the CMR. This event will provide detailed insights into all the important considerations required to decide whether or not to apply to—or attend—a uni in the US. There is much to consider! No booking is necessary—just turn up on the night. For more information, contact Michael Triff, Coordinator of Non-UK University Applications, 01235 849129. Parents of the current 3rd Year and above are reminded of the school's BYOD scheme. It is a expected that all Middle and Upper School students will bring in an appropriate laptop style device into lessons as part of their normal 'kit'. Student access to the internet is now part of many lessons therefore, if a member of the class does not have access, they will not be able to fully take part in the activity. A Q&A document is available and if you have any questions please email Ben Whitworth, Director of eLearning. Parents and boys should, please, check that School Uniform fits, and purchase any larger items if necessary. Boys have recently been reminded that School Uniform, Sports Kit lists and the Dress Code for all years are on one website page: School Uniform. Boys are expected to have their shirt top buttons done up. Dates of opening of the Second Hand Uniform Shop are on their usual page, together with details of how to sell your second hand uniform. Many thanks to all involved in SUS, as the boys benefit from money raised which is donated to the School. On Monday 10 December at 7.30pm, Blue Peter Science Guy, Greg Foot, will be presenting his 'Everest Lab' stage show in the Amey Theatre, using demonstrations and photos from his expedition to the world's highest pop-up lab at Everest Base Camp and describing the effects of high altitude on human physiology. Tickets are available from the Amey Theatre box office or online. All proceeds from ticket sales will be used to support Greg's free presentation for local, partner primary schools earlier in the day for which over 400 children from seven local schools have already booked! If you have any questions, please contact us at touchliners@abingdon.org.uk. If you’re looking for special gifts that you won’t find on the high street, then look no further than the ever-popular Christmas Fair at St Helen and St Katharine School. Held on Saturday 24 November from 10am to 3pm, the Fair will feature over 50 stalls located in attractive spaces across the school, creating a lively marketplace atmosphere. Students’ and Young Enterprise teams’ stalls create even more of a buzz. And an added bonus is the fabulous raffle of gifts donated by the stallholders. You can also relax over street food and other foodie treats in the school’s sit-down café, prepared by its award-winning catering team. The Fair is organised by St Helen and St Katharine Parents' Association and its proceeds are shared between the school and its 2018 charity, Mercy Ships. Entry costs just £2.50 per adult (children free). So put the Fair in your diary today! The Raymond Blank Cookery School, Monday 17 & Tuesday 18 December, St Helen & St Katharine. A very well done for all of the students and staff who took part in the Sponsored Walk on Thursday 27 September. The current total raised has reached £22,594.42 which is a phenomenal achievement. The online donations page will be shut on Friday 16 November and we hope to have a final total shortly after this date; therefore could any outstanding sponsorship be returned to school or donated online as soon as possible. The annual Abingdon Independent Schools’ Careers Convention, jointly run by Abingdon School, Our Lady’s Abingdon and St Helen and St Katharine, provides an excellent opportunity for students to gather information about and insights into careers of interest and educational routes into those careers. It features parents and alumni of all three schools, as well as local employers, representing a wide range of careers. Students can meet with ‘career representatives’ one to one, participate in small group career discussions, and watch panel presentations on current topics. The event is always well attended – and much appreciated – by 500 students and parents. This year’s Careers Convention will be held on Friday evening 15 March 2019 at Abingdon School. At present, I am recruiting Abingdon parents to volunteer as a ‘career representative’ (or to serve on a panel presentation, if preferred). To register your interest, please complete this online Expression of Interest form no later than 30 November 2018. Completing this form DOES NOT commit you to being a volunteer; it only tells us of your interest. I will follow up with you to provide further information and answer any questions you may have. Michael Triff, Head of Career Guidance. If your son is participating in the Morrisby Aspirations Career Matching Programme, he will soon receive an email with the date, time, and location of his interview with an independent careers adviser from Morrisby. This interview will be next week on one of the following days: Tuesday - Friday, 6 - 9 November. Thank you for ensuring your son has put this appointment in his planner/diary and that he sets aside some time this weekend (if not already) to go over the results of his Morrisby questionnaire with you, to research occupations listed in his results, and to complete the pre-interview questions - all in his online Morrisby account. The Morrisby Aspirations Programme can help to inform A-Level subject choices from a career planning perspective, so thank you for ensuring your son makes the most of his participation. Michael Triff, Head of Career Guidance. Harry the Piano - Wednesday 7 November in the Amey Theatre at 7pm. Tickets are going fast for this event with this internationally known piano virtuoso improvisor/extemporiser. Harry is giving a masterclass with our pupils in the afternoon, but the evening event should be terrific. Please see the poster and book your tickets online - they are free of charge, but we do need to know who is coming. Solo Concert Platform - Thursday 8 November in the CMR at 6pm. An opportunity for you to hear some of our emerging solo talent. JCS - Sunday 11 November - Mozart's Requiem as part of St Helen's School's Festival of Remembrance at St Helen's School at 7pm. The festival will also include WW1 songs and readings by pupils with the Requiem in the second half. Please see the poster and book your tickets online through the St Helen's School website. Music Society Violin Masterclass with Levon Chilingirian – Wednesday 21 November in the CMR at 6pm. We are so lucky to have such a connection with one of the world's most distinguished violinists. Every two years Levon Chilingirian comes to Abingdon to give an open lesson to a number of our more advanced violinists. Thanks to our Music Society admission is free and it should be seen as a must for all our string players and their families. Next week, all students in years 1-5 will receive a Pocket Guide to Grammar, Punctuation and Spelling from their English teacher. We hope that your son will use this comprehensive reference guide not just for his English work but across all his subjects. Further information, including a downloadable version of the guide, is available here. Parents are reminded that, to discourage parking on these private roads, a company is employed by Christ's Hospital to fine cars parked there. Visitors should use the School's Lower Field Car Park on Park Road, and then report to Park Lodge Reception, please. How strange and unreal it seemed, as again we paced the streets of our quiet little country town! For in a brief few weeks, the world had changed. The story of the Great War, as experienced by the Abingdon School community, is told in a selection of readings drawn from the school's archive, supported by photographs, images and music to evoke the experience of a school community as it attempts to make sense of events unfolding in France and beyond. Presented by senior drama scholars, this is a free event that is expected to last around an hour. No booking is necessary. Alton Brown is an exceptional athlete, and one of the most prolific and successful athletes of the past 20 years. He’s an ambassador and a great role-model for Sport Karate. 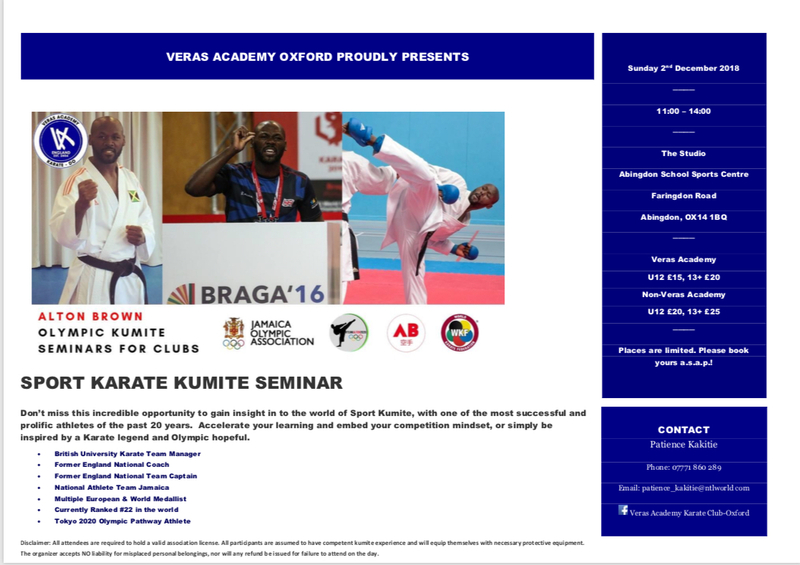 We hope that the boys attending Karate Club will be inspired to attend this seminar, on their own doorstep, as well as those who attend Karate Clubs outside Abingdon School. All are welcome. Reports will be posted to the Parent Portal over the course of Saturday 13 October. For years 1-4 and L6th, this report is designed to give a quick snapshot about how things have been going over the first few weeks of term and will comprise grades from subject teachers along with overall communication from Tutor and Housemaster. Years 5 and U6th will have a fuller report this session, balanced by a shorter report at the end of term. Abingdon's grading system for subject reports remains unchanged and an explanation of how grades are awarded is given on the report (we have updated the grade descriptors to acknowledge the arrival of number grades at GCSE). All of the grades get turned into two average Effort and Achievement percentages which are also listed on the report; these offer an instant view of how a particular boy is getting on. As a rule of thumb, percentages in the 60-70% range indicate that things are going well, percentages reaching 80% and above mean that things are going extremely well indeed and percentages dropping into the 50s and below indicate that some things may be going awry. We do not report on Other Half or instrumental lessons in this session; those reports come at the end of term. Parents may like to note that, as well as the Tutor and Housemaster comment they can see on the reports, all the reports in a year group will have been read by a senior member of staff before they are sent out. This allows the senior team to keep in touch with trends and concerns across the school. Parental feedback on reports is welcomed - in the first place you should contact the relevant Housemaster. Please read about the 5th Year Work Experience Scheme here and how you can support your son as he seeks to secure a placement for summer 2019. Is applying to US universities right for your son, especially since there are so many excellent universities in the UK (and other European countries)? If this is a question you and your son are pondering, you are invited to attend the US University Advice Evening at Abingdon School on Thursday 22 November 2018, 6pm to 7.45pm in the CMR. This event will provide detailed insights into all the important considerations required to decide whether or not to apply to—or attend—a uni in the US. There is much to consider! No booking is necessary—just turn up on the night. For more information, contact Michael Triff, Coordinator of Non-UK University Applications, michael.triff@abingdon.org.uk, 01235 849129. The School is still awaiting confirmation of certain dates for the public examinations in the summer of 2019 but wanted to make you aware of one change that the Joint Council for Qualifications (JCQ) have brought in for future examinations. For the first time a national contingency examination day has been arranged for I/GCSE and GCE (A/AS-level) examinations ‘should sustained national or local disruption arise during the examination series’ and therefore any examinations need to be rearranged. The date that has been set aside as the contingency day is Wednesday 26 June 2019. This means that all examination candidates must be available to sit examinations on Wednesday 26 June as well as for their timetabled examination dates. This is not a school decision and applies to all candidates in all schools. Silver walking assessed expedition (5th years): Sunday 30 June - Wednesday 3 July. This now creates a clash for the musicians who are on tour to Japan, and these boys will be contacted separately by Mr Dempsey. Gold walking assessed expedition (L6th): Sunday 23 -Thursday 27 June. The Friends of Abingdon School Boat Club invite you to join them for their annual Quiz and Curry Night in the Abingdon School Dining Hall on Saturday 10 November - Arrive at 7pm, Quiz starts at 7.30pm. This is a fun evening to test your general knowledge and includes a delicious curry supper with drinks available to purchase. All age groups and guests are welcome. There is plenty of friendly rivalry between the various parents’, boys’ and coaches’ teams! Please encourage your sons to join you; it is always as enjoyable for the boys as it is for the adults. Boys tend to make up one team per year group. You do not need to make up a team; we will put you together in groups of 6 or 8 so it is the perfect opportunity to meet other parents in your son’s year group before the regatta season starts. If, however, you already have a team, just email fasbc@abingdon.org.uk and let us know the team name and members. Harry the Piano Workshop and Evening Concert - Wednesday 7 November, Amey Theatre at 7pm. Please see the poster and this link to the website information. This is an event not to be missed by our pianists and their parents! Mozart's Requiem - Joint Choral Society Concert on Sunday 11 November, Yolande Paterson Hall, School of St Helen and St Katharine, 7pm. Half term is a good opportunity for parents and boys to check that School Uniform fits, and purchase any larger items if necessary, as well as getting ready for colder weather. School Uniform, Sports Kit lists and the Dress Code for all years are on one website page: School Uniform. Boys are expected to have their shirt top buttons done up. Dates of opening of the Second Hand Uniform Shop are on their usual page, together with details of how to sell your second hand uniform. Many thanks to all involved in SUS, as the boys benefit from money raised which is donated to the School. As has long been our practice, boys should have clean-shaven faces, unless this has been agreed, for religious reasons, by the Headmaster. Full details of the dress code are available on the School Uniform Page. Top Hat is based on the 1935 RKO movie and brings the glamour of Hollywood’s golden age and the glorious, tap-dancing magic of Fred Astaire and Ginger Rogers to the stage in one of the greatest dance musicals of all time. Parents should expect that traffic flow in Abingdon will be severely disrupted by the Abingdon Fairs. On Monday 8 and Tuesday 9 October vehicle entry to Park Road and Park Crescent will only be via the gate on Faringdon Road (along from the Coach Park). When leaving the park through the gate into Faringdon Road, please, when queuing, leave the gate clear for incoming traffic. Please see attached map. Senior Music Competition - Thursday 1 November, CMR at 6pm - Parents and friends are welcome to hear our instrumentalists of grade 8 plus battle it out for this year's prestigious cup. Our adjudicator is Neil Farrow, Director of Music at Our Lady's Abingdon Senior School. Harry the Piano Workshop and Evening Concert - Wednesday 7 November, Amey Theatre at 7pm - We are delighted to welcome the internationally known artist, Harry the Piano, and his dazzling improvisation and skills of virtuosity. Harry is also leading a workshop for pupils from local schools in the afternoon. Do join us for this unique event - tickets are free of charge. For further information please see the poster and the page on the website. Solo Concert Platform No 2 - Thursday 8 November, CMR at 6pm - Here is another opportunity to hear some of our solo musicians in performance. Admission is free and all are most welcome. Mozart's Requiem - Joint Choral Society Concert on Sunday 11 November, Yolande Paterson Hall, School of St Helen and St Katharine, 7pm - Our joint School's Choral Society of Mozart's Requiem forms part of the SHSK Festival of Remembrance to commemorate the centenary of the Armistice at the end of the Great War 1914-18. There will also be readings and period popular songs to set the scene. Evensong at New College, Oxford - Wednesday 14 November at 6.15pm - Don't miss Adam Treadaway's first official outing as the new Director of our Chapel Choir at the local medieval chapel - the scene of chorister training for many of our top singers, past and present! Music Society Violin Masterclass with Levon Chilingirian - Wednesday 21 November at 6pm, CMR - We have another welcome return of the famous violinist, Levon Chilingirian, and an opportunity to celebrate the playing of some of our fine violinists. Financed by our Music Society, these are always fascinating events and should be seen as a must for our string players and their families. Please join us. The Old Abingdonian Club, Abingdon School’s alumni association, will host a 6th Form Careers Evening on Friday 16 November 2018, starting at 6pm in the Yang Science Centre and followed at 8.30pm by a networking supper in the Dining Hall. At this event, OAs at early or middle stages in their career will share with 6th Form pupils insights into their current occupation and the choices they have made along their career journey to date. The event helps to inform pupils of options to pursue after leaving Abingdon, as well as gives them insights that might influence longer-term career planning. Please encourage your L6 or U6 son to attend. He will soon receive an email invitation with a request to register for the event with the deadline of Friday 9 November. Thank you for your support! Questions? Email michael.triff@abingdon.org.uk. Each year Abingdon offers its Upper Sixth medicine applicants the chance to have a practice interview with someone from the medical profession. We rely on volunteers, parents and OAs to staff this event. This year it will be held on Tuesday 6 November from 6pm to 8.30pm in the Science Partnerships Laboratory. If you feel you can help out then please email Ben Whitworth. We aim to run a mock Multiple Mini Interview session (MMI) and any experience of these would be welcome. Due to the success of our July camp, we are running an additional two-day camp this year for boys aged 8-13 years of age. This is a high-quality, coaching course led by ex-professional players and current academy and county level coaches. Learn and develop existing and new skills, whilst experiencing the day to day life of a professional. Core skills, such as catch and pass, tackle, breakdown, support, back play and set piece play will be covered in a fun, safe and enjoyable environment. This is aimed at participants who are currently playing, or aspiring to play at first team level at their school and clubs. For more information or to submit the online registration form, please click here. We will then contact you to take payment and to confirm your place on the course. Chaplaincy Welcome Event and Parents' Prayer Group Thursday 11 October, 7.45pm. The Atrium, St Helen and St Katharine School, Faringdon Road, Abingdon. This will be a joint meeting with SHSK, Abingdon Prep and the Manor Prep School. All parents are very welcome to come and learn about the spiritual life of the schools and about various Christian activities. Our guest speaker will be The Reverend Jane Chaffey, Chaplain at Wycombe Abbey School between 2008 and 2018. There will also be a presentation from Anthony Bewes, Director of Lymington Rushmore, an organisation that supports the work of chaplaincies in independent schools and runs outstanding holidays and revision camps. Thursday 17 January, 8pm at 29 Park Road, Abingdon. Tuesday 18 June, 8pm in the School Chapel. If you would like further information, contact Rev Dr Simon Steer, school chaplain. A reminder when planning Saturdays in the second half of this term, and on into the new year…. Boys are expected to be available for matches against other schools unless specific permission has been sought from, and granted, by the Headmaster. Please avoid asking for leave of absence, as it hinders the progress the boys make. Any request should be made well in advance, at least one week before the fixture. The Director of Sport and PE, Pete Bignell, should be copied in on any such leave of absence request. Join us as Richard takes us on his personal journey, from his challenging lows to the summits of peaks around the world. To book tickets, please visit the Horizon Lectures website.